A: Unlike the classic ladder & sponge method, the water-fed pole allows the cleaners to reach windows from the safety of the ground. The expandable rod is 22 metres long and can easily reach even smudges on the fourth floor of your building. Q: What other cleaning alternatives are are part of window cleaning Longthornton? A: Besides providing diligent exterior window cleaning, the licensed technicians can also climb and wash any commercial skyscraper – a service called rope access window cleaning. Finally, the cleaning adepts can also take care of dust found on the interior surface of your panes, and will employ ladders and sponges to access distant corners. A: Our water has been filtered from all naturally occurring hard minerals. As a result, it will efficiently dissolve all streaks on its path and will evaporate under the sun without leaving residue marks of its own. A: Yes, the Longthornton window cleaners will arrive with the latest cleaning gadgets to rinse industrial buildings both short and tall. The pros can also carry out extra cleaning tasks, for instance patio washing and gutter cleaning. A: Certainly. The team's water-fed rod is linked to a special filtered water container inside the washing caravan. In case the fluid has been used up, the experts will kindly ask you to supply them with any interior or outside water source. A: Yes, all our services are thoroughly insured for your peace of mind. However, our washing method is among the safest that you can find on the market and we'll make sure to wash your windows without leaving a single graze mark! After going through lots of client feedback, we've adjusted our window cleaning Longthornton's fees. Now, you can book our service at prices that are nothing short of competitive! For further details, please check out our price table below. According to your needs, our window cleaning Longthornton can offer you with three options. 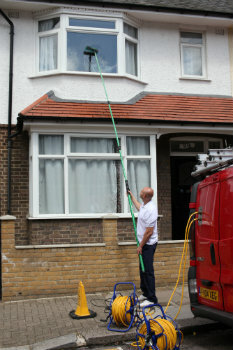 If you pick exterior cleaning, the technicians will utilize a special water-fed rod. This equipment can expand up to 22 metres in length, which is comparable to the height of a four-storey building. The Longthornton window cleaners will use purified water under high pressure that will rinse away all stains in almost an instant. If you own a lofty property instead, then opt for our rope access window cleaning. There, a team of approved abseilers will painstakingly polish your windows until they witness the mirror image of the setting sun. For your comfort, we maintain the cleaning equipment on a frequent basis and can send COSHH reports at your request. For in-house washing, the adepts will bring ladders and sponges to ensure that even the highest corners will benefit from proper treatment. Over time, we've reacted to the cleaning calls of clients from many neighbouring regions. As a direct result, we widened window cleaning Longthornton's horizon and you can now spot our cleaning vehicles in the districts below. For those of you who'd rather book window cleaning services Longthornton SW16 online, fill in our get a free instant quote form.